« How to migrate from Mendeley? What is a project and when should I create a new one? In Docear, you may work with multiple projects that are all listed in your workspace panel. We are often asked what a project is intended for and for what kind of work exactly one should create a new project? We suggest that you create different projects only for entirely different and independent kind of works. For instance, I created a project for Docear’s manual, another project for Docear’s teaser video, and another project for my own PhD thesis. 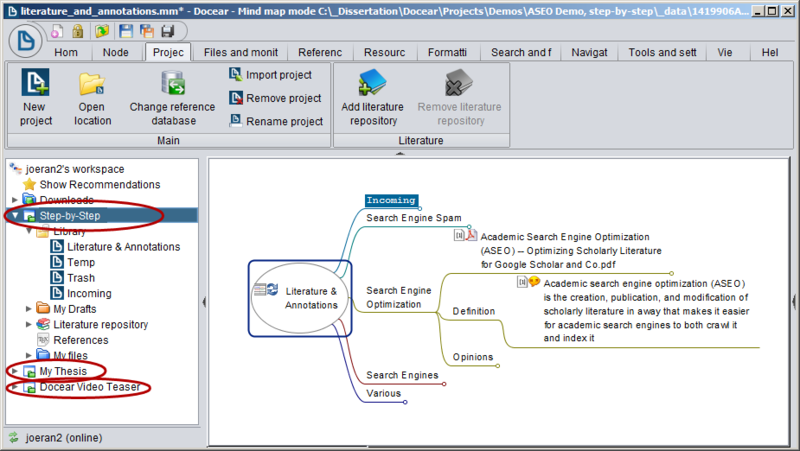 I am not creating new projects for every paper I write (instead, I only create a new mind map within my Thesis project to draft a new paper). You might think of a project as something you would want to share with others. For instance, I do have my PhD thesis project with all the literature I annotated during the past few years. When I want to write a new paper with my colleague, I wouldn’t mind to give him access to all my literature including annotations, and my other drafts, because my colleague would need access to most of my literature, and maybe even to old drafts, to write the current paper. Therefore, all my literature and drafts that somehow relate to my PhD thesis are in one project, and I do share the entire project with my colleague via Dropbox. Now, for Docear’s manual I needed to create many examples that do not have anything to do with my thesis or papers I am writing. It might also be that a user (you?) asks for access to the example files to translate them to another language. I certainly wouldn’t mind to give you access to the manuals’ example project. However, I wouldn’t give someone who wanted to look at the example files, and whom I don’t know, access to my PhD project. Hence, the example files for the manual are in a separate project, so I could share the project easily via Dropbox, independently from my PhD project. If in doubt, manage everything in a single project rather than creating a project for every little piece of work, and keep in mind that it is not (yet) comfortably possible to use literature from one project in another project.